Integrated maintenance management without paper. ManWinWin WEB has a dynamic interface that ensures a good user experience from any mobile device with an Internet connection. Relevant real-time maintenance information. 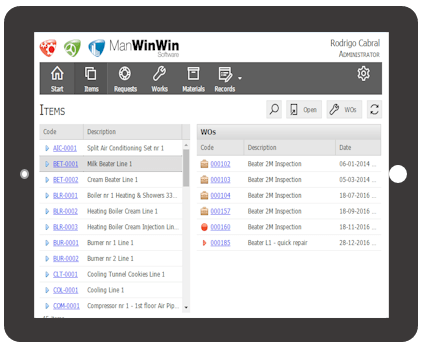 ManWinWin WEB is a set of applications that facilitate access for managers, technicians, customers or suppliers to relevant maintenance information. Ensures greater involvement of all stakeholders in maintenance. The access profiles are dynamic and changeable. Possibility to view all objects for which you have access level (cost center or customer) with information on technical data, Work carried out, ongoing and planned. The user can view all his works and, according to the rights defined for each profile, mark the work as executed or approved, make the report or finish the Work Order. Technicians must register corrective work orders as soon as they finish a job. 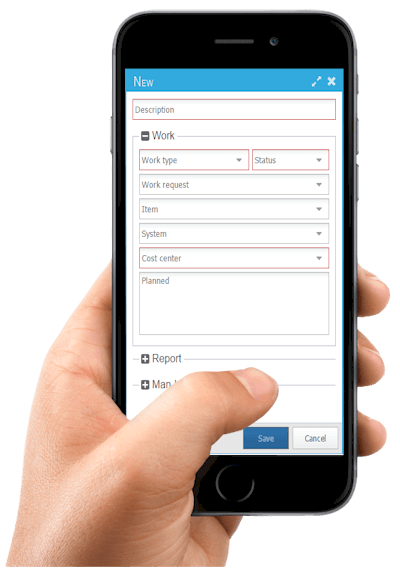 The simplified interface allows, from any computer or mobile device, to register work orders and record the time spent on them. Operators usually make maintenance requests in real-time. The interface to register an application for maintenance has few mandatory fields and helps with the filling in of requests based on the data provided. Warehouse outputs can be done by the warehouse supervisor (if there is one) or by any technician entitled to sign off stock. The interface is simple, with few mandatory fields and if used from a computer with a reader, is equipped to scan bar codes. Possibility to register labor, materials – direct purchase or warehouse – and services for any Work Order. Three videos that let you know all the features of ManWinWin WEB. Use the button in the lower right corner of each video for full screen or open directly on youtube for a better view. This example describes the typical case of a service provider using ManWinWin WEB to manage the entire flow of information without having to use paper.